Neymar scored a spectacular goal as Barcelona came from behind to beat Paris St-Germain at the Nou Camp and finish top of Group F.
Zlatan Ibrahimovic gave the visitors, who started the game top, a 15th-minute lead with a low finish from 10 yards after being teed-up by Blaise Matuidi. But Barcelona were behind for only four minutes, Lionel Messi equalising with his 75th goal in the competition after Luis Suarez's ball across the six-yard area. Lucas missed a golden chance for the visitors before Neymar's sublime 41st-minute finish, a 25-yard effort that dipped and curled before nestling in the back of the net. Edinson Cavani had a shot cleared off the line by Barcelona's Marc Bartra before Suarez stabbed home his side's third goal after goalkeeper Salvatore Sirigu had kept out Neymar's 77th-minute effort. Paris St-Germain will enter Monday's last-16 draw unseeded and will hope to avoid a future meeting with Barcelona in the competition after being taught a lesson in finishing. "Luis Enrique might have stumbled across something there with his 3-4-3. Or to give him more credit, masterminded it. Hope he sticks with it." Barcelona finish top of Group F. Paris St-Germain will be unseeded in Monday's last-16 draw. Entertaining game sprinkled with some breathtaking action. Two minutes of added time. Free-kick to PSG just outside the area. Zlatan Ibrahimovic fancies a second goal. He strikes it well but it whistles over the bar. Barca are finishing strongly. Lionel Messi lets fly from just inside the area. It's dipping. It's curling. It's wide by a whisker. It's all getting a little niggly. PSG vent their frustration as Thiago Motta clatters into the back of Luis Suarez. There's no theatrics this time from the Barca forward. That was a clear foul. PSG only have themselves to blame. The visitors have carved out some great chances but have been unable to punish Barcelona. Cries of 'Suarez, Suarez' ring out as the Uruguay forward fires home from close range after Salvatore Sirigu denies Neymar but can't keep out of the follow up. Surely that's game over. Barcelona are going to finish top of Group F.
Another change for the hosts as team captain Andres Iniesta makes way for club captain Xavi. Standing ovation as Pedro, who has been operating down the right, is replaced by Ivan Rakitic. Barcelona not happy to settle for a slender lead. Twenty five minutes left for PSG to come up with an equaliser and win the group. They'll fancy their chances after a poor defensive display by Barca. More panic inside the Barca penalty area! Yet again PSG cannot take advantage as Maxwell mis-hits from a good position. Another chance goes begging. But what is going on in that defence? Twitter: 82,570 fans at the Camp Nou tonight - the biggest gate of the season so far. First caution of the match and it's Edinson Cavani who is in trouble with Martin Atkinson for hauling down Neymar. That near miss has given PSG confidence. This game is far from over. 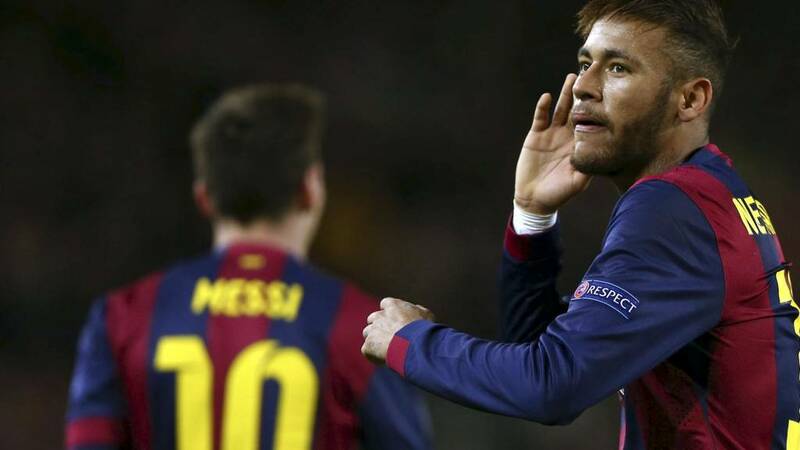 The noise that greeted Neymar's world class strike has been replaced by a hush. There's a lot of nail biting taking place among the home fans. Pin ball inside the Barca penalty area after the home defence is left horribly exposed. Lucas' pace has caused the home side problems all game and it is his run that causes panic, Edinson Cavani's goal-bound shot is blocked before an almighty scramble. Zlatan Ibrahimovic climbs above Jeremy Mathieu to meet a corner but can't direct his effort on target. PSG need to make the most of their set-plays. Steve Crossman, football reporter for BBC World Service: "This must feel remarkably familiar for PSG. I was at Camp Nou when they took the lead in the quarter finals just over a year and a half ago. They had enough chances to make the game safe but were punished by a clinical Pedro finish in the last 20 minutes. Yet again they've had every chance to bring further joy to that small pocket of fans up in the gods of the stadium, but they've come up short." Martin Atkinson gets us back under way. I get the feeling the Bradford ref is enjoying this as much as the home fans. As it stands, Barcelona will finish top of Group F. There's 45 minutes left. Can Paris St-Germain respond? The second-half is about to start. Twitter: Lionel Messi has equalled Raul's record of 75 goals in Europe's major competitions. "Fascinating formation/strategy from Barcelona's Luis Enrique. Potentially even revolutionary. Very, very different. I Really hope it's more than just a one-off. There's a lot to like about Barca's 3-4-3. Messi, Suarez, Pedro, Neymar and Iniesta in same line-up, for starters. Huge attacking potential. But it's very risky and requires a lot of work defensively. It demands a huge amount of running from Pedro and Neymar, who have whole wing to cover. "One thing's certain: that half was the most fun I've had watching Barca in a long, long time. And from the Camp Nou reaction, fans felt the same." This is turning into one of those 'I was there' games. Wonderful entertainment at the Nou Camp. It's advantage Barcelona thanks to Messi and Neymar. But don't write off PSG and Ibrahimovic yet. Out of this world. Sublime. Breathtaking. Sensational. Neymar's goal was all that and more. You'll be hearing a lot more about that finish, believe me. Take a bow, Neymar. The Brazilian spent the first 15 minutes of the game hobbling after a challenge but there is no stopping the forward as he power towards the PSG goal before dispatching a superb curling 25-yard shot that nestles in the corner of the bet. World class. Brilliant one-touch football from Barcelona results in a chance for Luis Suarez but his fierce effort is kept out by Salvatore Sirigu. The hosts are upping the tempo in the closing stages of the first half. Barcelona have had 61% possession and four attempts on goal. But they are still on level terms. The first signs of frustration from the home fans after a stray pass. PSG looking comfortable. Television replays pick up on Laurent Blanc's reaction to that miss by Lucas. Let's just say the PSG boss doesn't look amused. Barcelona's defending is suspect to say the least. How did Lucas miss? If Paris St-Germain don't qualify as group winners then they will regret that. Blaise Matuidi whisks in a super cross for the Brazilian midfielder but he fires wide from close range. Paris St-Germain are still in the driving seat as far as Group F is concerned but Barca are coming at them. A second home goal and it's all change at the top of the group. One chance each. One goal each. That's why Lionel Messi and Zlatan Ibrahimovic are world beaters. Anything Zlatan Ibrahimovic can do, so too Lionel Messi. The Barcelona striker nets Champions League goal number 75 with a right-foot close range finish after Javier Mascherano's initial long ball forward is hooked across the six-yard area by Luis Suarez. What a game. You can't give Zlatan Ibrahimovic that amount of space! The unmarked PSG striker produces a low finish from 10-yards after being teed-up by Blaise Matuidi. Where was the Barca marking? That was terrible by the hosts. Twelve minutes in and little from Zlatan Ibrahimovic so far. But we've heard that before. The 33-year-old PSG striker is coming into this game in hot form having netted four times in his previous three appearances. Concerns on the Barcelona bench as Neymar is left limping after catching the heel of Lucas. The Brazilian is soldiering on for now, but he doesn't look happy. Steve Crossman, football reporter for BBC World Service: "The feeling in Paris is that PSG will really send a message if they get a point or more at Camp Nou tonight. "They were only a minute or so away from a semi-final spot last season and to prevent Barcelona from winning their group for the first time since 2007 would represent a significant coup." Free-kick to Barcelona just outside the French penalty area. This is prime Lionel Messi territory. He eyes the net before running up...and fires narrowly over. Lots of back slapping, smiles and handshakes between both sets of players in the tunnel before the game. The old pals act is over. Barca are playing a 3-4-3 formation with . Pique, Bartra, Mathieu at the back. Pedro and Iniesta are wide midfield, with Mascherano and Busquets in the centre of the engine room. We're under way at the Nou Camp. abandon a Euro 2016 qualifying match between Serbia and Albania when violence on the pitch and crowd disturbances broke out after a drone was flown over the pitch carrying a political message. Twitter: There will be 574 media professionals from 158 different media companies covering the game tonight. 3-2 win in the French capital in front of "99 Problems" rapper Jay-Z. But it is two years since Barca failed to win a group game in front of their own fans. Make no mistake, it is going to require something extra special from PSG to finish top of Group F.
"Luis Enrique's selection roulette spinning out of control, it seems. Pedro and Mathieu at full back, no Rakitic or Xavi. Bold. Very bold." Barcelona starting XI: Ter Stegen, Pedro, Pique, Mascherano, Mathieu, Bartra, Sergio, Iniesta, Messi, Suarez, Neymar. Paris St-Germain starting XI: Sirigu, Van der Wiel, Silva, Luiz, Maxwell, Verratti, Motta, Matuidi, Moura, Ibrahimovic, Cavani. No "weather bomb" in Barcelona but it was still chilly enough for one Barca player to wrap up well in training ahead of tonight's game. He comes from the land of sun, sea and samba so perhaps Neymar can be excused for covering himself from head to toe to keep out the cold. Will the Brazilian leave PSG hot and bothered? So, both Paris St Germain and Barcelona are through to Monday's draw whatever the outcome at the Nou Camp. Time for both teams to put their feet up? No chance! Barcelona do not want to go into next week's draw unseeded. Even if they manage to avoid Bayern Munich, they could still land an tricky two-legged date with Premier League leaders Chelsea - unless they win tonight. Easier said than done. Paris St-Germain are unbeaten in 22 Ligue 1 and Champions League games this season. One is a European superpower. The other is looking to establish itself as a continental force to be reckoned with. One possesses the all-time top scorer in Champions League history. The other has Sweden's all-time record goal scorer in their ranks. It's Barcelona versus Paris St-Germain, Lionel Messi against Zlatan Ibrahimovic. Both teams are through to the last-16, but Barca have work to do. Failure to defeat the Parisians in their final Group F game and the four-time champions of Europe run the risk of bumping into their old boss Pep Guardiola and Bayern Munich in the next round.